This content is a follow up from my About Me page. Never in my wildest dreams did I think it would have such a positive impact on my site visitors. I get loads of feedback about that page. Many visitors get in contact to thank me for inspiring them to change their life too. Fantastic News… I wish you all the best for your new future! You will gain much more than you ever imagined. Let me know how you get on. I also get many people asking more questions about this website and SBI. There’s so much curiousity and interest in the SBI system. I probably did not explain it well enough, so I’ll expand on it here for you. I get the same question over and over again. I signed up with SBI in 2008 and started building this site about Cyprus. To be totally honest with you, I didn’t take it seriously at first. But I gradually realized the SBI system worked. So I put more effort in. My first source of income was through putting google adsene ads on the site. Google is a major money earner for most, big and small web business. I get a 3 figure monthly cheque from google at the moment. But as my site grows, the earning grow too. There is no upper limit to what I can earn, as long as I keep working on my website the cheques will get bigger. The more visitors like you, who visit my site the more money I can make. Think of building an online business, not just a website. Thats the SBI motto. Building any type of business needs commitment and lots of work at the beginning before you see the fruits of your labour. The rewards of the labour are worth it. Some SBIers - as we effectionatly call ourselves earn up to 10.000s per month! I started getting requests from home owners and developers wishing to advertise property on this site. So I now earn money by building property advertisement pages. I also receive a referrer/finder fee when the property sells through my website. Earning through referral finders fees can be very financially rewarding. I can bring in significant "referral income" by simply focusing all or part of my site on business referrals. I also earn commission advertising holidays, hotels, car hire, related books and products. There are so many ways to make an income from my site. Such as, advertising other business products and services related to the theme of my site. Every new page I add to my site generates more income. It’s like opening a new savings account every time I add a new page. 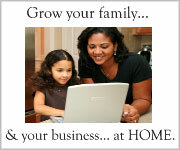 As I mentioned on the work at home business page, I have 2 sites now. This one and Free Family Healthy Recipes so the income potential doubles over time. The internet is open for business 24 hours a day and so my websites are open 24/7 to do business. I make money while I sleep. The beauty is, when I complete a website, it will earn money for the rest of my life. Then move on and build another one. Many other SBIers – (as we are affectionately called) go on to build 2,3,4,5 plus sites. Imagine that! You wouldn’t believe the income some SBIers are making. I love to read their Success Stories. How some have become financially independent enough through site income to give up their day job. As long as I keep following the SBI Video Action Guide all the way, may success story will be similar. This is the question I get asked the most. Well, the answer… yes and no. It’s not just a simple process of creating a few basic pages and thinking the money will start rolling in. I always point out to everyone who asks; that it does take time. It’s not a get rich quick scheme. You need to commit to hard work up front to build a successful e-business website following using all the toolstools provided . I’m not a good writer? No problem! Don’t worry about having good writing skills, SBI will teach you that as well. When anyone asks me this question I direct them to these free downloadable books written by Ken Evoy the founder of SBI. What ever problem or concern you may have, SBI have it covered. There’s no need to worry. You have a true guide all the way. All you need to bring is your brain and motivation to succeed. It’s that Simple. How much time do I work on my website? When I started this site, I had some situations in my life to deal with. So I only built one or two pages a week. In the beginning you are learning a lot at the same time. After my life got back to a degree of normality, I put more effort in to it. I worked about 10-15 hours per week. Don’t get too bogged down by time. Everyone’s life situation is different. You will find your own work pattern. And, I find some days everything just flows and other days not. Some SBIer can only work on their site at weekends, maybe evenings or days off. While some able in a position to work full time. what to create a website about? Even if you did have some ideas, you may change your mind when you get started with SBI. It’s very common. They teach you how to use the brainstorming tools, help you find business ideas and if it will be profitable. I had a few ideas at the beginning but dropped them because the SBI process showed me even better ideas with more money making potential. They Say it's $299 a year , that sounds expensive, is SBI really worth this much? I understand your reservations about forking out $299 a year. The $299 is Canadian dollars. Which converts to approximately $290 american dollars. I pay my fee in UK pounds which amounts to approximately 187 pounds - depending on exchange rate. That's just over 50 uk pence per day or less than 1 Canadian dollar a day. I can't think of a better way to spend 50p. There is also a monthly payment option $29.99. It’s worth every penny or cent!. When you see how much they do to help you succeed. What does SBI do for me? SBI! provides hope and a solid guided path to self generating financial security for rest of my life. I am free to choose my future lifestyle. I have no doubt about that. Start your new future today, try SBI for a few months, you’ve got nothing to lose and much more to gain than you could ever imagine. Don’t let life pass you by. Don't just take my word for it, watch the short video below. Wishing you all the best and future success. Think SBI is right for you? Yes! between 75-250 dollars every time you sell a Solo Build It Package. You can start promoting right now. 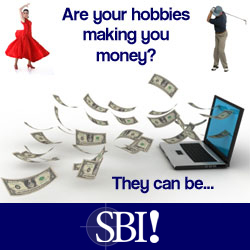 You don't need to purchase SBI yourself to become an affiliate and its free to join. Click the image below for full details. Looking for a New Business?